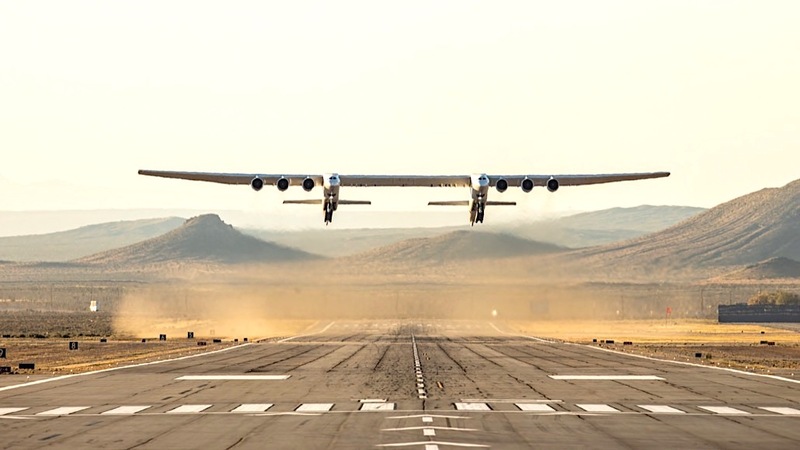 Stratolaunch Systems Corporation, founded by Microsoft co-founder Paul G. Allen, successfully completed the first flight of the world’s largest all-composite aircraft, the Stratolaunch. 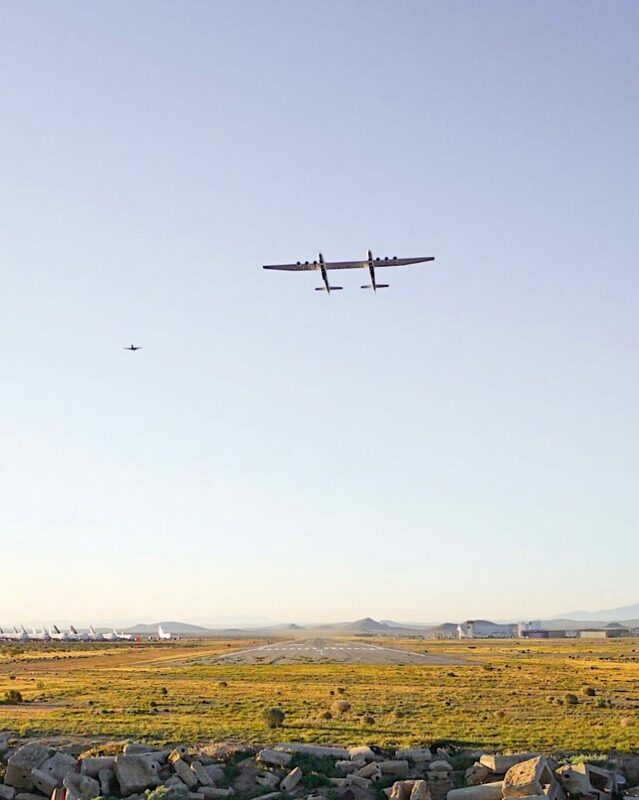 The Stratolaunch aircraft is a mobile launch platform that will enable airline-style access to space that is convenient, affordable and routine, according to the company. The reinforced centre wing can support multiple launch vehicles, weighing up to a total of 227 tonnes. The Stratolaunch is powered by six Pratt & Whitney PW4000 jet engines formerly used on the B747. With a dual fuselage design and wingspan greater than the length of an American football field, the Stratolaunch aircraft took flight from the Mojave Air & Space Port’s Civilian Aerospace Test Center in California and conducted an initial test flight that lasted 2.5 hours achieving a maximum altitude of 5,180 metres and a top speed of 304 kph before landing. To view a video of the first flight see here (opens new YouTube window). 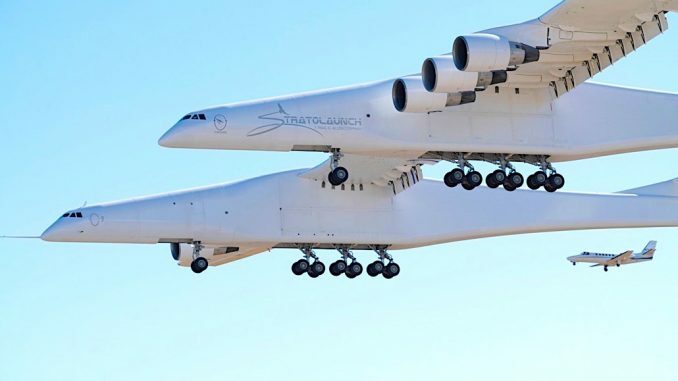 The gigantic Stratolaunch has the largest wingspan in the world at 117.3 metres, significantly larger than the previous record holder, the Antonov An-225 ‘Mriya’ heavy lift cargo aircraft. • Conducted simulated landing approach exercises at a max altitude of 5,180 metres mean sea level. The gigantic Stratolaunch has the largest wingspan in the world at 117.3 metres, significantly larger than the previous record holder, the Antonov An-225 ‘Mriya’ heavy lift cargo aircraft. The Stratolaunch is powered by six Pratt & Whitney PW4000 jet engines formerly used on the B747. Saturday’s first-ever test flight of Stratolaunch was flown by experimental test pilot Evan Thomas. Thomas is a 28-year veteran of the US Air Force, F-16 pilot and former vice wing commander of the 46th Test Wing and former director of NATO Combined Air Operations Center 5.